The cows of the village have “escaped” I remember the saying from a Spanish song, thus we started with our cows. 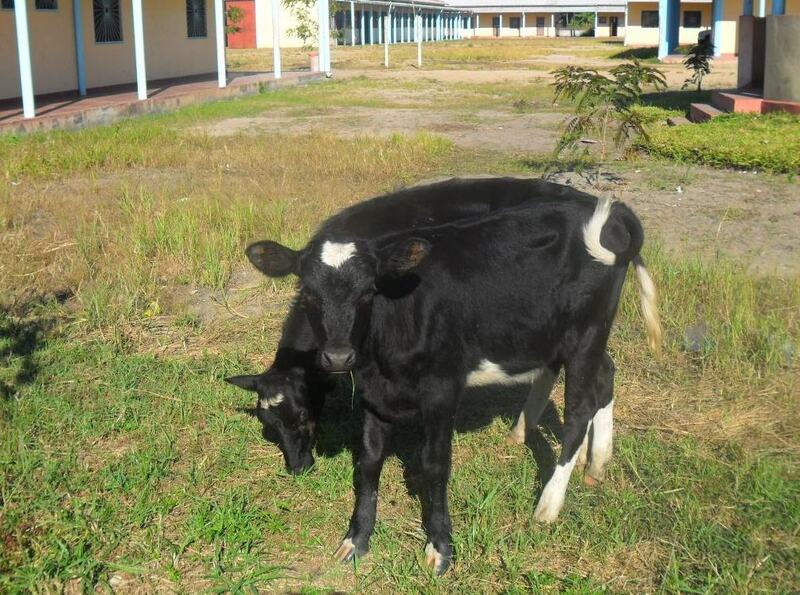 The news reached some of our friends that Lar São Jerónimo now had cows! And the real thing! It was first an idea, then an intention, later a commitment, because there were people who had offered to finance them, Thanks! And finally it is a reality that, for various reasons it has taken longer than expected. On April 13, a Saturday afternoon a truck appeared from the Esmabama Association with the first pair of cows that entered this compound. 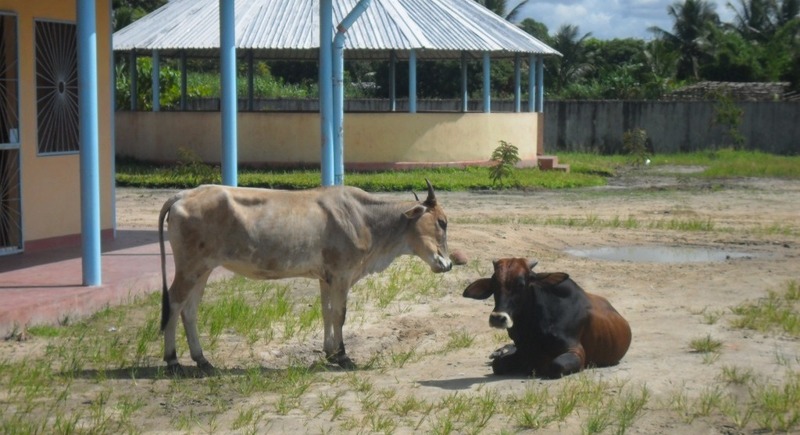 They came from Brarada, where the first Somascan fathers resided and began their work in Mozambique. We did not know what to do. We had the fenced area with a gate but not completely finished and had to bring them there we removed some bamboo fencing and putting some boards to bridge the gap between the truck and the ground the two animals marched down. Quite a sight! That day, there were not many people, some children had left and those who were at home mingled around, but with an eye on the lookout and kept their distance “just in case” and those who prefer more adventure came closer to see if they could help and see up close those “beasts ” so big. The animals got out of the truck pretty calmly and did not give much trouble going to fenced area; it was hard to keep up. But after a while, at nightfall, the guards and some of the older children told us that cows are walking “outside their home”. Let’s see what we do! They had found the part that was unfinished and putting them back was not going to help much. We decided to put them where the goats spend the night, a closed and protected area and goats in a little smaller place, in this case with rabbits. The first adventure was to move the goats, which are known to be quite stubborn, so with some with ropes, others on our shoulders (an image which seemed to be taken from a nativity scene) and did not give too much trouble. The real adventure was with the new tenants, first to find them, although they are really big it is not easy to see at night between buildings, trees, grass and certain areas without light. Once found … it was not too much trouble, the real problem was not moving them, but … to where. They did not like narrow places or where there were gates close by … There was nothing to do, flashlights, sticks: all to no avail. We had to give up; they laughed at us all they wanted. 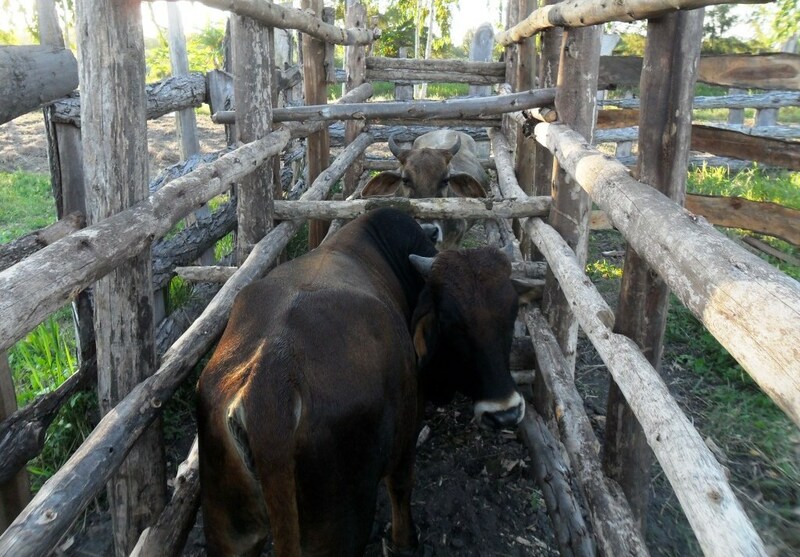 First task had to be: to seal the fenced area and train someone well in the breeding of cattle, something that began on the Monday. The issue of food and drink was no problem with a good grass up the knees and three ponds, thus they could feed well. 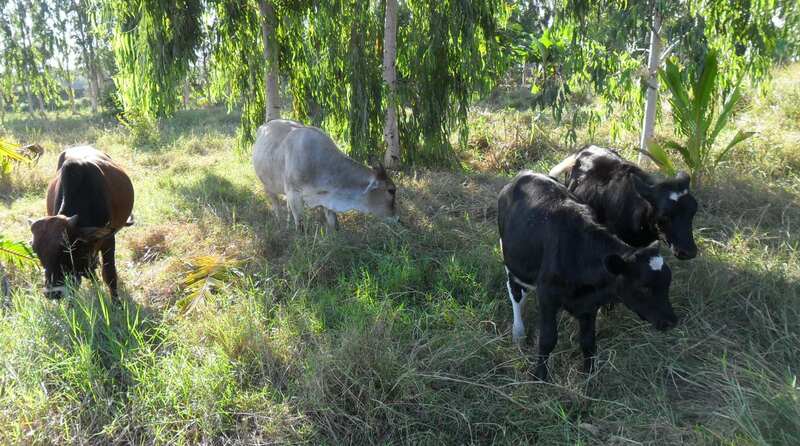 Month or so later, on May 27, went in search of milk calves the first two were for meat The dairy heifer calves themselves were not yet a year old, they will be in the month of July, two female bicolor, black with white spots. 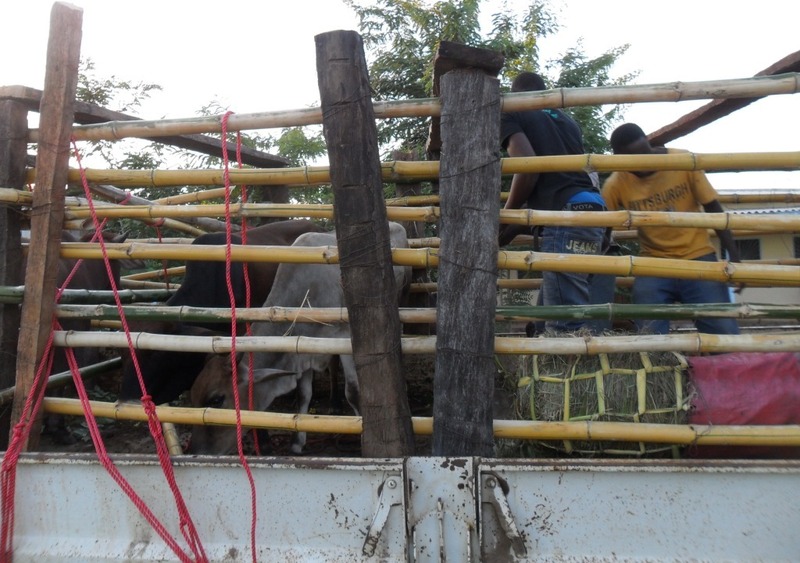 Here we were able to load them into our car, the pick-up, as they call a car with the open air trunk, the hooves were tied Roped, to avoid them getting up on the two kilometer distance home to the Lar from the farm of origin. They also escaped their first night, but no problem getting them back to the enclosure, as we had more experience and they are more docile than we expected. Here the problem was that the security measures “anti-escape” were prepared for the other two, which are double in weight and size. So the next day we had to reduce certain spaces and … even with this, one of them returned the next night to it’s the old ways and escaped. To find from where it escaped, because the next day she was heard bellowing near the chapel when the Mass was beginning, we struggled to find the place where she was getting out, but between closing spaces and them getting used to their new home … we have managed that they remain within the enclosure. 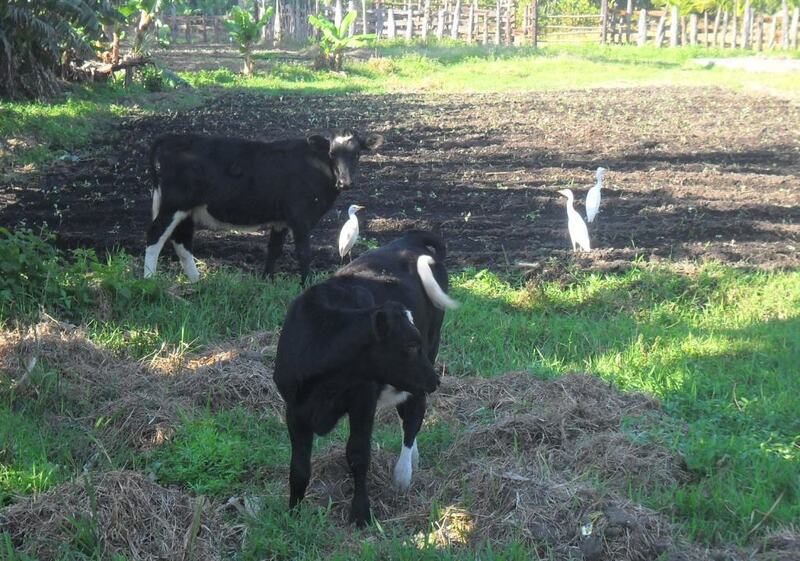 The first two are male and female, Café and Canela, respectively, their name, is inspired by the color of the coats, they are a Brahma breed. The two dairy cows are a Dutch breed, still we cannot say which is which the names that we have are: Lua (​​Moon in Portuguese) and Comet. The most rebellious is Canela three mornings we struggled to make her come into the “shower hall “, that was also an adventure worthy of videotaping. Luckily no one recorded the scene! Cafe did not give us so many problems, it took a while, but since the first day, not without fatigue and with a few races, it received its first shower, which must be repeated every 15 days. With the funnel-shaped pen we made, it makes the job easier, but Canela, remains very much Canela. Small Lua, always restless and adventurous, and Comet, with her broken voice and I would say (if the musicians are not scandalized) more out of tune, do not give much trouble for such care. 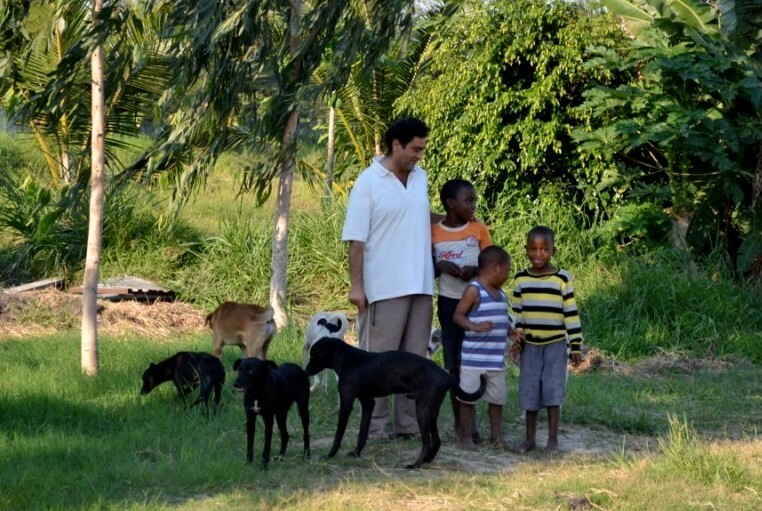 The care other animals is ongoing … Now, what we’re doing is preparing enclosed area also for the goats, who are destroying every plant they reach, and the first plantings in the garden … we cannot let these “devouring animals” loose. The plan is to raise more cattle, but we have to go slowly, picking up the pace and see how things go. Something we have not written of before or in this present article: “man’s best friend”, usually used to refer to dogs. The number has been significantly reduced (if not “very much “) not just in our house, but in the wider area, another disease that is decimating the animal population, in this case canine. File Photo: before the decimation of the canine population. 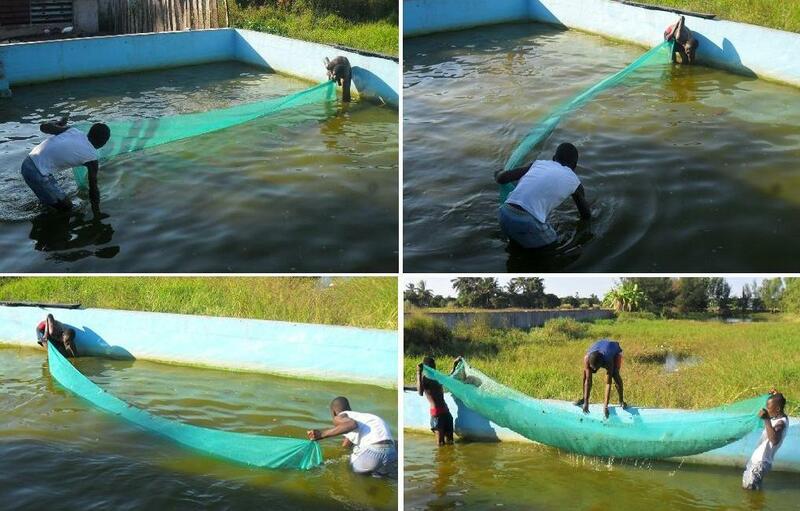 Newsflash: we have just had the first days of large-scale fishing in our fish farm. Although, with cat-fish, which are larger, we caught only a few, there was a plentiful catch of the “macacana” fish, over one hundred and then cooked in tomato sauce (the base of most sauces used in our house) and eaten with rice, it was a good meal. ← VACCHE nel Lar San Girolamo!